Movie theater seating: Why don’t American theaters have reserved seating? Why don’t movie theaters have reserved seating? Sure enough, when I arrived at 5:40 for a recent 6 p.m. showing of Woody Allen’s latest, I found lots of jumpy half-couples in the lobby, checking their phones, shifting their weight from foot to foot, eventually looking up with a relieved smile that said, There you are! I’m glad to see you. But let’s get in there right now. In the already half-full theater, my companion and I zoomed toward a pair of choice empty seats. We nearly sat down before we realized the seats were being “held” by a headband—presumably the only garment a New Yorker dressed for August could spare. Forced to retreat into the stream of fellow seat-searchers, we pushed on toward another open pair. Except these ones weren’t empty either. Someone had left their laptop—their laptop!—on the armrest. Eventually we were forced to settle for seats much farther back, up against the side wall. This undignified scramble isn’t confined to hot Manhattan afternoons or Woody Allen’s latest and greatest. Versions of this melee occur on busy nights in theatres across the country. And the worst thing about this cinematic insanity? It’s seemingly unnecessary. Some of life’s little stresses—bone dust-spewing dental drills, the unspeakable user interface on my cable box, people texting during the movie itself—can’t be avoided. But here’s an idea to smooth the theatre-going experience for all Americans. Why don’t we reserve our seats in advance? I know, it’s crazy talk. But Americans expect reserved seats at many concerts and sporting events. And if you’ve been to the movies overseas, you know how few countries put up with our cinematic seating scrums. In much of the world—the United Kingdom, the Netherlands, South Korea, Sweden, Turkey, India, Singapore, big cities in Japan, Russia, and China—reserved seating is the rule. Elsewhere, in countries like Brazil, filmgoers can usually choose between reserved and open-seating theaters. The advantages of reserved seating seem, at first glance, to be unassailable. Most obviously, you sit where you want. If it’s busy, you choose your own compromise—in the middle rows but on the side, for example, or a frontish row, but centered. If you have limited mobility, or don’t feel comfortable staggering down a darkened, steeply inclined row, you can reserve an aisle or ground-floor seat. Not long ago, I watched an elderly couple arrive maybe 20 minutes before a show only to find an already-packed theater. In obvious distress, they had to separate, and the gentleman nearly fell as he made his way to his single seat, past teenagers too rude to stand up to let him pass. With your seat assigned, you don’t need to arrive crazy early, or stand in a long line, or rush into the theater, precariously balancing Sunday manners against fired-up lower-brained competitiveness. If you’re on a date, you don’t need to worry about playing it cool while also making sure you get a really great seat. You don’t need to mark your territory with clothing or personal electronics before going to the bathroom or dropping six bucks on a tub of Coke. And if you’re attending with friends—for many, the sole remaining attraction of going to the movies, given the improvements to the home theater experience—you know you’ll be able to sit together. With so much to recommend reserved seating, we might ask why the U.S. stands apart from most of the rest of the world. 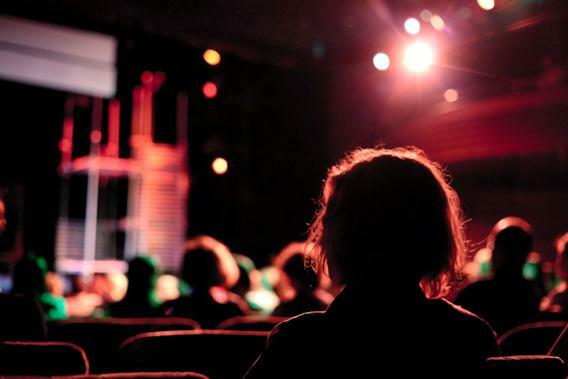 Well, there are some advantages to open seating, as well—at least for theater owners. The sooner you arrive, the hungrier and thirstier you’ll get. Since it went big in theatres during the Great Depression, popcorn prices have increased a diabolical 666 percent, while ticket prices have risen just 66 percent. And the earlier you arrive, the more ads you’ll watch. Cinema advertising is big business—about $650 million in 2011. The audience, according to the (hardly impartial) Cinema Advertising Council, is uniquely “attentive, engaged, and comprised of highly desirable young, affluent, and well educated consumers who aren’t distracted.” I don’t know about attentive—but you’re certainly captive. There are other advantages for theater owners. If you knew beforehand just how crappy a seat you were going to end up in—and that it might not even be adjacent to your loved one’s crappy seat—you might go to another cinema. Or you might just not go at all. Patrick Corcoran, vice president of NATO (the National Association of Theatre Owners, of course), told me that some U.S. theaters that have tried reserved seating have seen a drop in attendance. Open seating is also simpler to administer. Arclight, a southern California theater chain with reserved seating, feels it’s necessary to offer customers detailed online instructions on how assigned seating works. (“The seat information consists of a combination of letters and numbers …”) Without a seating chart to ponder, ticket window transactions are faster. If reserved seating would be pricier for theater owners, then it would surely be pricier for consumers, too. Part of me would love it if Arclight went national. But Arclight is a premium chain—your reserved ticket comes with extra-wide seats, no ads, and a higher-than-usual price tag. In fact, reserved seating in U.S. theaters, as in other countries where a mix of open and reserved exists, is almost always a luxury experience. AMC, for example, now offers reserved seating in its premium dine-in theatres—along with personal recliners, alcoholic drinks, and push-button chair-side service. In an America that is increasingly divided along economic lines, I’d be worried about an explosion of premium theaters, or a national move to reserved seating that might raise prices for everyone. As more and more details of daily life are determined by income, the movies remain as shared a cultural space as we’ve got left. Some open-seating proponents argue that our current system is more democratic as well. I don’t buy that. It simply rewards those who plan ahead and get there early rather than those who plan ahead and reserve a seat online (not everyone has Internet access, but then not everyone has a free half-hour to burn, either). Still, I agree that open seating seems more democratic. The theater, when we enter it, feels like an easily understood common space, like a park or a bus. First come, first served. And open seating is certainly less formal—another occasional American virtue. Reserved seating may also vaguely offend our sense of freedom. This feeling may not be logical—under reserved seating, with a little foresight, you’re arguably more “free” to sit where you want—but then, few feelings are logical. “It’s about choice, which is something we Americans place a lot of stock in,” explained Chris Gordon, the New York–born editor of the St. Petersburg Times, an English-language paper in Russia’s second city. Gordon pines for American-style free seating, and notes an additional, practical advantage: the freedom to make on-the-fly decisions to avoid people who are tall, loud, or smartphone-addled. But in Britain—surely the greatest nation, as far as queues are concerned—seating is generally reserved too, and perhaps in more than one sense. James Wilkinson, an English-born editor, suspects the English preference for assigned seating stems from a national “distaste for social interaction outside of pubs.” Examples like India and England suggest that at the movies at least, Americans operate in a rare middle ground: outgoing and generally rule- and line-abiding. So, OK, the mayor of Bethesda, Md., is unlikely to condemn Arclight’s planned theater in the city as a crime against the American Revolution. But if open seating for nearly everyone is holding prices down, then it might be worth keeping, if the movies in America are to remain even a shadow of what they once were—inexpensive, informal entertainment for everyone, together. In other words, my fellow Americans, I will see you—reluctantly, and ridiculously early—in line.